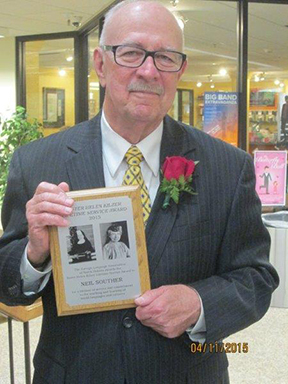 Congratulations to Neil Souther, on receiving the Sister Helen Kilzer Lifetime Service Award! Retired teacher wins Foreign Language "Lifetime Service Award" Neil Souther, former Latin, French and English teacher for Bismarck Public Schools and later Mandan Public Schools, has been awarded the Sister Helen Kilzer Lifetime Service Award by the Foreign Language Association of North Dakota, of which Neil was an active member. The Sister Helen Kilzer Lifetime Service Award was created for two purposes: first, to honor Sister Helen Kilzer, who has demonstrated a lifetime of service to the teaching and learning of world languages and cultures; second, to honor those, such as retired teachers and professionals who have served in the profession of the teaching and learning of world languages and cultures; and who, like Sister Helen Kilzer, continue to demonstrate a lifetime commitment to the teaching and learning of world languages and cultures even after retirement. Neil taught in Bismarck for over 35 years, and, after retiring from the district, returned to the profession to teach Latin in Mandan for eight years until a replacement teacher could be found. He officially retired in 2013. During his career, he was instrumental in bringing the Junior Classical League to North Dakota, in the writing of the North Dakota foreign language standards, and in developing the introductory foreign language classes at the middle schools in Bismarck. He was, and continues to be, an inspiration to his students and fellow educators because of his passion for and dedication to learning languages. *Information and photo provided by Valerie Kling, Susan Devine and FLAND (Foreign Language Association of North Dakota). Thank you for honoring Sister Helen Kilzer in such a meaningful way. It brings her, and all of the Benedictine Sisters of Annunciation Monastery, great joy!